The jaguar is the third-largest animal in the cat family, after the tiger and the lion. Dating back to almost half a million years, the jaguar strode the entire length of the American continent from just below the Arctics in the north down to Patagonia in southern-most Argentina. But sadly, it has found its present day habitat restricted to the tropical jungles of Central America and Amazon in South America. This translates into a habitat loss of almost 40%. Not a single jaguar has been spotted in the US in the last half a century. There were populations of the cat in New Mexico, Arizona, Texas and Florida, but hunting forced it into extinction by the 1950's. The jaguar is probably the most nimble and acrobatic among the cat family. Apart from being an expert swimmer, it's a superb climber of trees and can kill prey much larger than itself. The largest among its prey is the tapir, the biggest animal in the Amazon basin. There are as many as 87 species that form the diet of the jaguar. The adult jaguar can reach a length of 6 feet and weigh up to 210 lbs. The males reach sexual maturity in three to four years, while the female does in two. The jaguar can mate all year round and degrees of birthrate correspond to the availability of prey. But a fast reducing forest cover has meant shortage of prey for the big cats, and as a consequence, lower birth-rates. The jaguar, being a mobile creature, requires huge expanses of forests in which it can hunt to sustain itself and its family. This is where it has been obstructed severely in the past few decades. Farmlands, ranches, growing urban sprawls and border-related infrastructure have badly eaten into the jaguar habitat along the Mexican-American border. While the entire population of the animal was wiped out in the U.S. decades ago, scarcely 100 to 120 of these creatures survive in the wilds of the Sonora state of Mexico, about 125 km south of the U.S. border. In fact, wanton development has cut off their migration routes to nearby tropical forest zones, a phenomena common to many pockets of jaguar habitat in Central America. Unaccustomed to being restricted in such tight and diminishing forest spaces, the jaguar has no choice but to target livestock in nearby farms and ranches, coming into friction with man. The jaguar is a shy, nocturnal and deep forest hunter – preferring the least human contact as possible. But urban expansion has snatched away a large part of this very private trait. The Amazon Basin in South America is one of the last bastions of the jaguar. It has vast tracts of forest acreage as its habitat where it still finds larger animals like deer, capybara, tapirs, and peccaries, as well as turtles, fish and otters to eat. But indiscriminate tree-felling for the purpose of farming, and deforestation to make way for large paper and timber projects, pose a distinct threat to the jaguar's habitat despite the vastness of the Amazon basin. There are only around 10,000 of these large cats presently in the South American continent, stretching from the Central Amazon basin in Brazil northwards to the Orinoco River valley forests in Venezuela and Colombia. The thick jungles of some tiny Central American countries still provide refuge to these cats. Belize has about 1,000 as per the last count. The 15,000 sq km Maya Biosphere Reserve in Guatemala is home to about 550. The Calakmul Biosphere Reserve in Chiapas, the southern-most state of Mexico bordering Guatemala, holds about 350 of these animals. Although hunting of the jaguar has been totally banned in these countries, poaching for the animal's beautiful spotted coat still continues and is a constant menace to the animal's survival. The CITES (Convention on International Trade in Endangered Species of Wild Fauna and Flora) lists the jaguar as an endangered species and this has been recognized by countries like Argentina, Brazil, Colombia, French Guiana, Honduras, Nicaragua, Panama, Paraguay, Suriname, United States, Uruguay, Brazil, Costa Rica and Venezuela – where hunting restrictions on the animal is already in place. 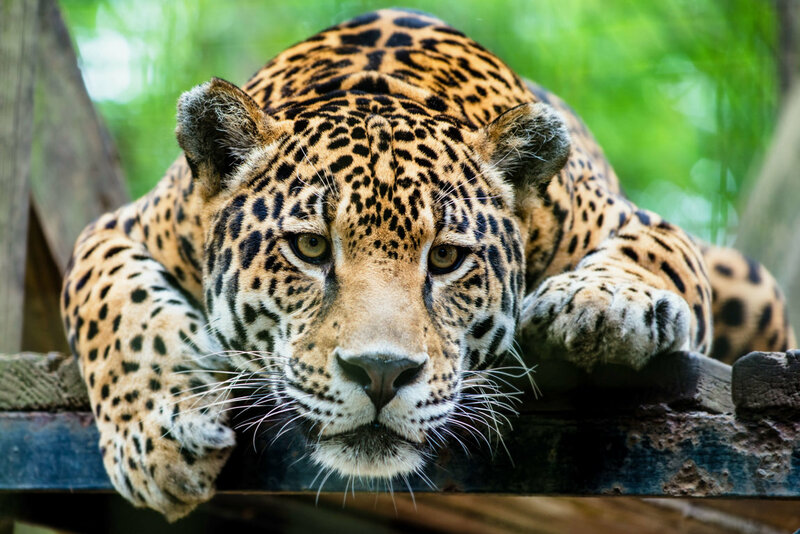 Over the decades there has been a trend on the part of conservationists and zoo authorities to move and increase the number of jaguars in captivity. But no amount of care and protection in captivity can substitute the freedom the beautiful cat enjoys in the wild, which is where it belongs. Jaguars kept captive in zoos are known for pacing due to the stress and frustration of their inability to carry out their natural routines and behaviors. Their stressful pacing increases as the number of visitors and noise level increases. Zoo jaguars are deprived of their natural environments and social structures for profit and human amusement. Zoos are not the answer to preserving species. Precious habitats must be preserved. That is the only way we can save future generations of the jaguar.